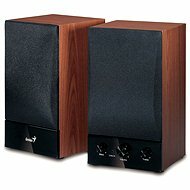 The SP-HF1800A is a new three-way wooden Hi-Fi speaker system with 50W RMS audio power. Cleverly uses cross-technology, which means that each speaker reacts to high, medium and low frequencies. The SP-HF1800A is a new three-way wooden Hi-Fi speaker system with 50W RMS audio power. 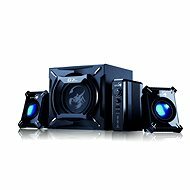 It cleverly uses cross-technology, which means that each speaker reacts to high, medium and low frequencies. The SP-HF1800A integrates all sounds with a perfectly integrated effect around the listener for excellent, balanced, lively and rich quality. 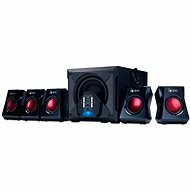 The middle unit uses a 4" speaker unit with a closed frame to deliver more accurate voice output and for most instruments with frequencies from 500Hz to 7000Hz. 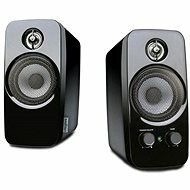 The lower 4" woofer is designed for long and deep bass with frequencies below 500Hz. For your own listening preferences, simply adjust the bass and high-frequency controls. On the front of the right speaker, the volume, treble and bass controls are practically placed and the headphone output is also present. Additionally, there is a connector for an external audio source. 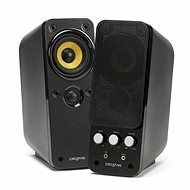 For shipping to other EU countries visit this page Genius SP-HF2.0 1800A black. Für Versand nach Deutschland, besuchen Sie bitte Genius SP-HF2.0 1800A schwarz. Chcete doručit zboží do Česka? Prohlédněte si Genius SP-HF2.0 1800A černé. Chcete doručiť tovar na Slovensko? 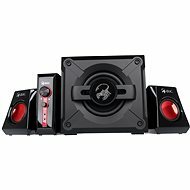 Prezrite si Genius SP-HF2.0 1800A čierne. Für Versand nach Österreich, besuchen Sie bitte Genius SP-HF2.0 1800A schwarz. Magyarországra történő kiszállításért tekintse meg ezt a termékoldalt: Genius SP-HF2.0 1800A fekete.